One of my favorite things about party planning is coming up with ideas for what to give the guests as a little memento. There are so many options when it comes to party favors but I tend to prefer giving edible gifts that everyone will love. 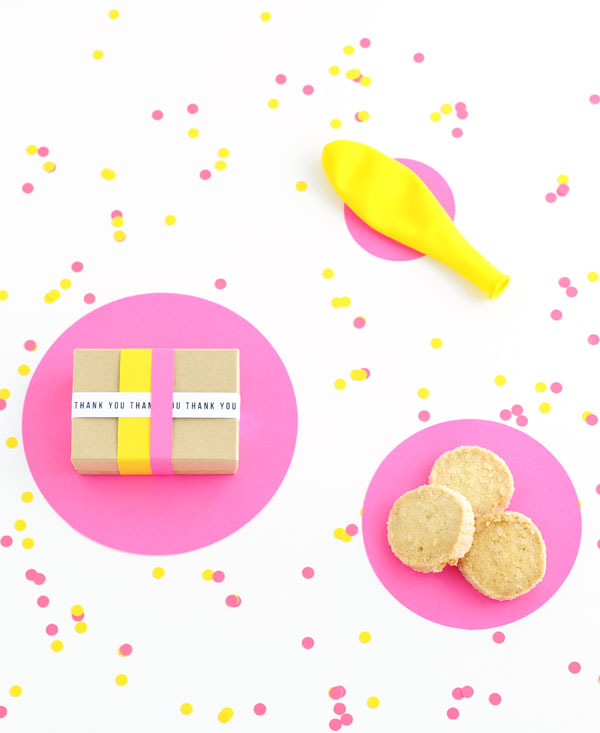 The presentation of your party favor is as important as what is inside, so adding a little attention to the packaging will impress your guests. 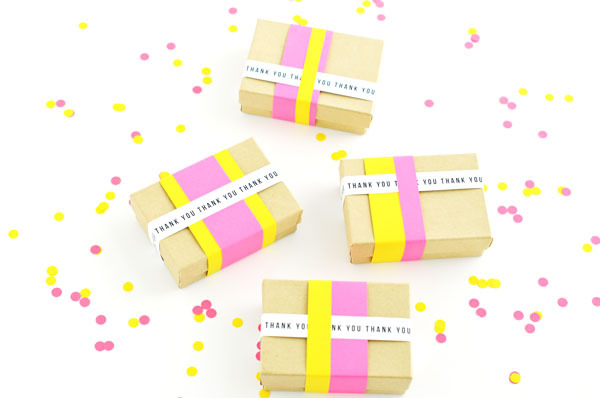 These paper stripes favor boxes are simple to make and easy on your wallet. You can add homemade or store-bought cookies, candy, or little trinkets inside the boxes. Step 1: Measure around the box vertically and horizontally. Step 2: Add 1 inch to the vertical measurement in Step 1 and cut the color paper this length. Cut paper in various widths (0.5 to 2 inches). Step 3: Add adhesive to the ends of a paper strip. Step 4: Wrap paper strip around the box and secure at the bottom of the box. Repeat with contrasting color paper strip. Step 5: Print or write out THANK YOU on white printer paper. 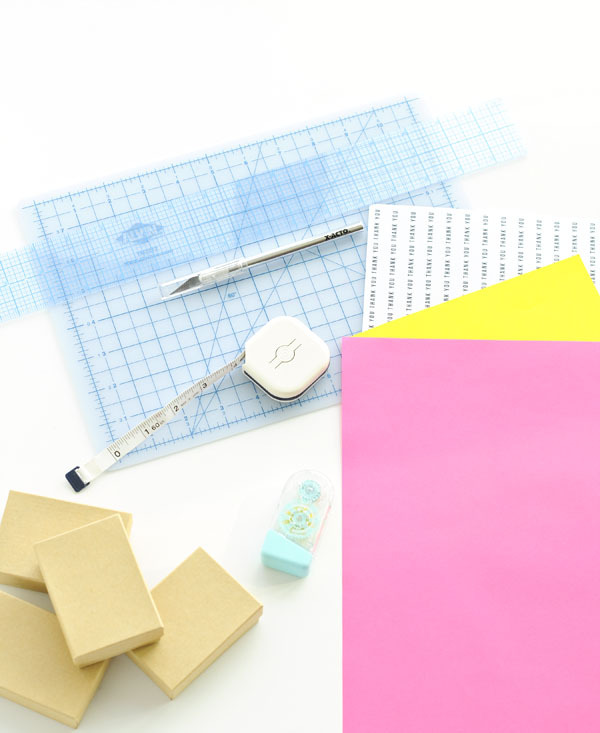 Add 1 inch to the horizontal measurement in Step 1 and cut the paper this length. Cut paper in long strips. Step 6: Add adhesive to the ends of the message paper strip. Wrap the message paper strip around the box and secure at the bottom of the box. This presentation is adorable! I think I will give these out as party favors when my birthday rolls around in October. These are so adorable! Reminds me of some beautiful favor boxes that my aunt made for my bridesmaids’ luncheon before my wedding. So. CUTE. These are so lovely, I can always count on your site for some inspiration. Have a great day! Fun, simple and thoughtful. Perfect little favors. This is one of my all-time favorite color combos. Obviously it’s a sign I need to try these for my next event! Thank you for sharing! What an adorable idea! Love it!! So gorgeous, something quite simply looks absolutely amazing. Ooooh, the colors! The boxes are neat, personalized and party-ish. Wonderful idea! I like this box DIY, the color combination is fantastic!!! What a great idea to spruce up a package! Such an adorable way to dress up standard brown boxes! Love it! sally, this is so cute! 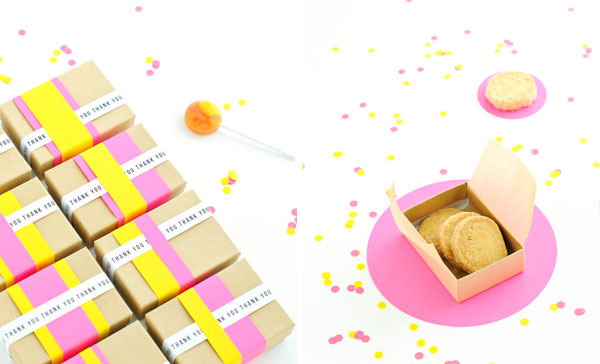 i also love giving edible presents as favours, the presentation is so simple and cute – awesome tutorial! its very beautiful and fantastic….. I agree that giving away little party favors is pretty awesome. I did that at my birthday party last month, but nothing so cute or delicious-looking as these! There is always next year’s birthday party to plan for!